You know, I thought our homeschooling experience last year was interesting, with Isaac being mobile and all. It had nothing on what this year is turning out to be! Last year, he was fairly content to play by himself with is cars or whatever I had out, as long as I was in the same room. Sometimes I'd find him, say, standing on the dining room table, if I hadn't been paying close enough attention, but for the most part, it wasn't so bad. Fast forward to this year, and it's an entirely different ballgame! He is not happy to play with his toys when his big sisters are doing something that is clearly much more interesting. 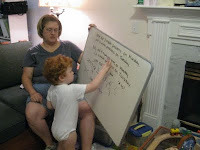 In fact, he seems to think he can do a better job of teaching than I can. He seems to be particularly fond of math. He does an outstanding job with the story problems, too. Truthfully, I believe the appeal lies in the white board and markers. 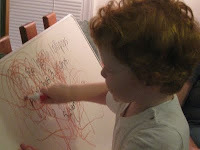 I finally gave him his own little white board, and that keeps him busy for at least a little while. It's not easy to keep him contained when he can climb out of the Pack n' Play and pull the baby gates open. Good thing he's so cute.